Des Moines, Iowa. November 29th, 2018– Wink, Inc. released third quarter, 2018 life sales results in its 85th edition of Wink’s Sales & Market Report. Wink’s Sales & Market Report, the insurance industry’s #1 resource for indexed life insurance sales data since 1997, expanded in 2017 to include fixed universal life (UL) and whole life product lines. 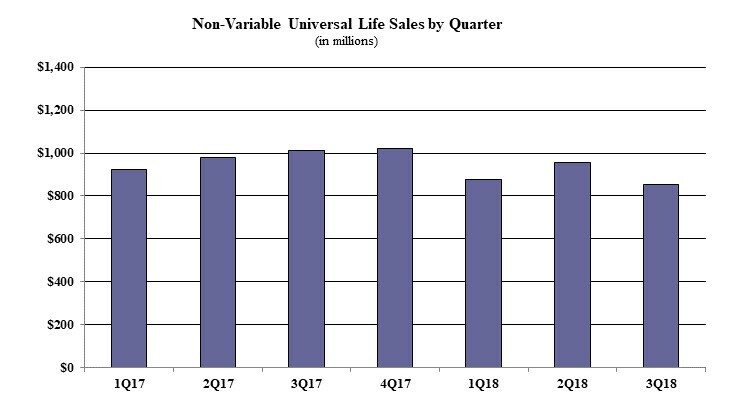 Non-variable universal life sales for the third quarter were over $852.4 million; down 11.0% when compared to the previous quarter and down more than 15.6% as compared to the same period last year. Non-variable universal life sales include both indexed UL and fixed UL product sales. Noteworthy highlights for total non-variable universal life sales in the third quarter included Pacific Life Companies retaining their rank as the #1 company overall for non-variable universal life sales, with a market share of 10.8%. Pacific Life’s Pacific Discovery Xelerator IUL was the #1 selling product for non-variable universal life sales, for all channels combined, for the fifth consecutive quarter. 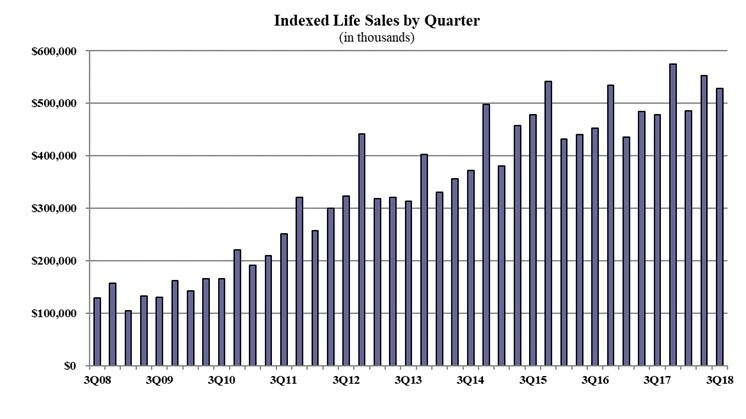 Items of interest in the indexed life market included Pacific Life Companies retaining the #1 ranking in indexed life sales, with a 16.9% market share. National Life Group, Transamerica, Minnesota Life-Securian, and AIG closed-out the top five sellers, respectively. Pacific Life’s Pacific Discovery Xelerator IUL was the #1 selling indexed life insurance product, for all channels combined, for the fifth consecutive quarter. The top pricing objective for sales this quarter was Cash Accumulation, capturing 82.6% of sales. The average indexed life target premium for the quarter was $8,997, an increase of more than 1.0% from the prior quarter. Fixed UL third quarter sales were $325.0 million; down more than 20.0% when compared with the previous quarter and down 39.1% as compared to the same period last year. 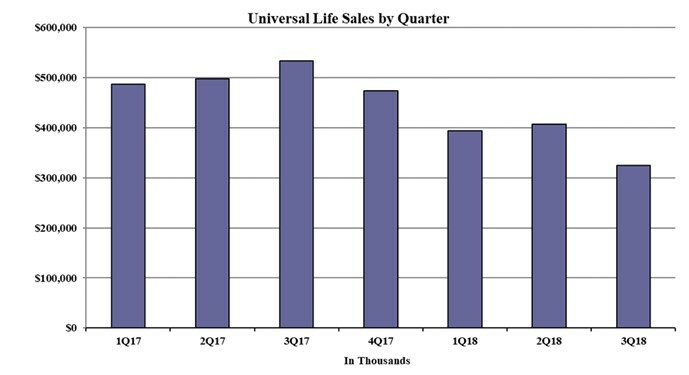 Noteworthy highlights for fixed universal life in the third quarter included the top pricing objective of No Lapse Guarantee capturing 61.5% of sales. The average UL target premium for the quarter was $5,744, an increase of 14% from the prior quarter. 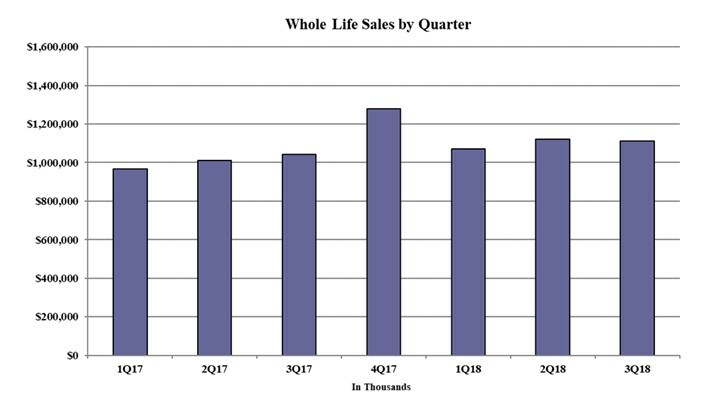 Whole life third quarter sales were $1.1 billion; down 0.7% when compared with the previous quarter, and up 6.7% as compared to the same period last year. Items of interest in the whole life market included the top pricing objective of Cash Accumulation capturing 72.4% of sales. The average annual premium per whole life policy for the quarter was $3,720, an increase of nearly 13.0% from the prior quarter. Wink, Inc. is the company behind the most comprehensive life insurance and annuity due-diligence tools, AnnuitySpecs and LifeSpecs at www.LookToWink.com. Wink, Inc. is the distributor of the quarterly Wink’s Sales & Market Report. Serving as the insurance industry’s #1 resource of indexed insurance product sales since 1997, this report provides sales by product, company, crediting method, index, distribution, surrender charge period, and more. Wink’s Sales & Market Report expanded to cover all fixed deferred annuity products in 2015 and all non-variable cash value life insurance products in 2017. The staff of Wink, Inc. has the combined experience of more than a century working with insurance products. Based in Des Moines, Iowa, the firm offers competitive intelligence and market research in the life insurance and annuity industries; serving financial services professionals, distributors, manufacturers, regulators, and consultants on both a domestic and global basis. Sheryl J. Moore is president and CEO is the guiding force behind Wink, Inc. Ms. Moore previously worked as a market research analyst for top carriers in the life insurance and annuity industries. Her views on the direction of the market are frequently heard in seminars and quoted by industry trade journals. Originally Posted by Press Release.